Rubber Ducky Theme Party - Boo Halloween boo! 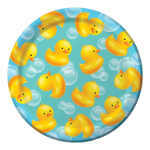 You’ll need these for a rubber ducky theme party! 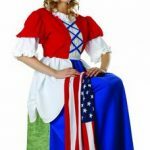 You want to throw a fun Halloween party for very young kids, but vampires and monsters are not your thing? 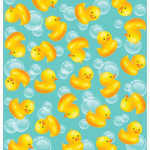 Then consider a rubber ducky theme party. Children love their Rubber Ducky. 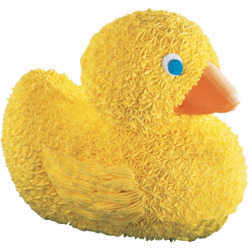 The classic yellow rubber toy has grown in popularity, and many parents emember the 1970’s, when Ernie from Sesame Street sang “Rubber Ducky” while taking a bath. 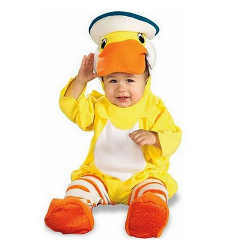 Thanks to Video’s, and MP3’s your Child can sing along with Ernie, or have their own rubber ducky theme party. This party is a fun one, and there are so many things you can do. make a ducky cake, play games, give out themed party favors, and even make balloons. Your party can be anything you want. You’re limited only by your imagination. Don’t forget to also listen to Ernie from Sesame Street singing the famous song! Start with the Invitations– You can either buy ones already made, or make your own. 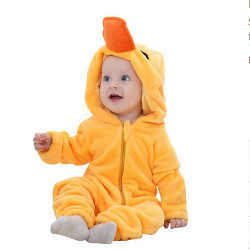 Take a photo of your child with their Ducky (a lot of people like personalized cards). Make copies of your picture, stick on blank cards and have fun decorating them. Or upload your picture to an online site that makes cards for you. 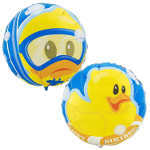 Wilton 3-D Rubber Ducky PanBuy on Amazon1) Either buy or make a Ducky Cake. Most Bakeries can make one, but if you want to do it yourself, watch this video and it’ll show you how. 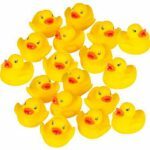 There are a lot of varieties of Duckies these days like Pirates for boys, Reindeer ones for the Holidays, and Fairy Tales for the Girls, and of course the classic yellow one. If the goose is not able to do this, they become “it” for the next round and play continues. If they do tag the “it” person, the person tagged has to sit in the middle. Then the goose is now “it”. The person in the middle can’t leave until the someone else gets tagged, and they are replaced. C) Have a relay for the older kids- Make teams with however many children you have. One child from each team has to sit and put the fins (flippers) on and race around something (could be a chair) and go back to the start and trade fins with the next child, until all children on that team has gone, and first ones done win. Note: You can also have the Children carry a “Duck Egg” on a spoon as they race each other. (this can be played with Miniature Ducks in a bucket or pool, finger puppets, or even the Children as the Ducklings). Four little ducks went out one day, Over the hills and far away. Mother Duck called, “Quack, quack, quack”. But only three ducks came waddling back. Three little ducks went out one day, Over the hills and far away. 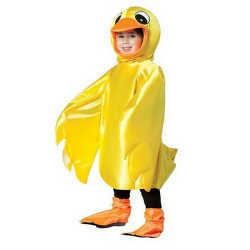 Mother Duck called, “Quack, quack, quack”. But only two ducks came waddling back. Two little ducks went out one day, Over the hills and far away. Mother Duck called, “Quack, quack, quack”. But only one duck came waddling back. One little duck went out one day, Over the hills and far away. Mother Duck called, “Quack, quack, quack”. But no little ducks came waddling back. Mother duck went out the next day Over the hills and far away Mother Duck called, “Quack, quack, quack”. And all the little ducks came waddling back. 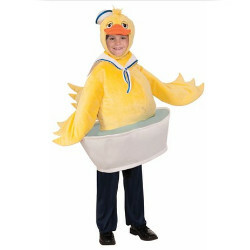 And of course, don’t forget a costume for your rubber ducky theme party! When you’re hosting an Halloween party it’s a requirement that you have plenty of sweets on hand. 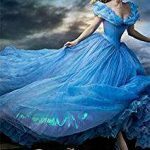 Candies for the favor bags, candies in pretty dishes on the table, candies hidden in pinatas and treasure chests and candies given as prizes during party games. 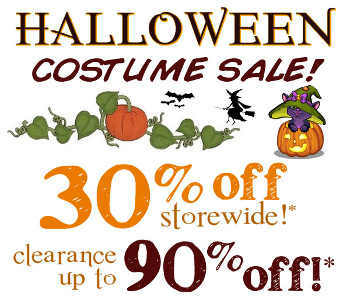 Honestly, you can never have too many candies when it comes to Halloween parties. Butterflies are pretty little creatures, so you don’t mind have them scattered all over your table or decorating the top of your cake. They’re not creepy looking like spiders or worms, so you don’t get that shiver running up and down your spine when a butterfly lollipop pokes it’s head out of your goodie bag.